Three feisty World War II reenactors portray the indispensable women of Britain’s Auxiliary Territorial Service . Reading, Pennsylvania reenactor Janet Brinker relaxes on a folding chair, patiently waiting for her ride. Her historic white nurses cap is marked with the familiar, reassuring Red Cross. Her modest blue-stripped dirndl is reminiscent of something grandmother might have worn. But when she turns to the side, her shoulder patch reveals an unexpected surprise. The patch represents her historic character’s hometown of Berlin, Germany. Brinker is among the thousands of people – mostly reenactors – who are on hand this weekend for the Mid-Atlantic Air Museum’s (MAAM) WWII Weekend. The annual event, which is generally regarded as the largest and best of its kind in the United States, runs through Sunday in nearby Reading, Pennsylvania. Reenactor Janet Brinker displays the German war era transportation tag. Like the multitude of living historians who have descended on the grounds of the Reading airport, Brinker is doing her part to preserve and present history. For this weekend’s festivities, Brinker is portraying a German nurse. One New Jersey resident, a beautiful young woman named Camille, was attending her first WWII event. Camille looked incredibly stylish in a khaki uniform – complete with a garrison cap – while dancing in the Officer’s Club with Sinatra tribute artist, Frank Cubillo. Camille said she usually portrays characters from the 1960’s, mostly because, “I am a child of the 60’s.” But this weekend has also made her a fan of the 40’s. 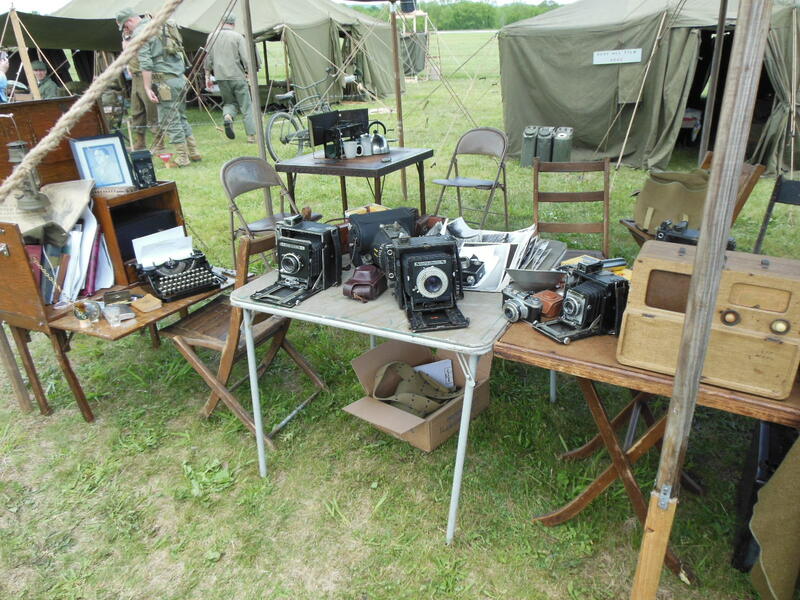 At the Army press tent, situated on the far side of the airfield, the 167th Signal Photo Company (Reenacted) presented an impressive display of the equipment corespondents and photographers took to war. Navy veteran Bill Beam of Indiantown Gap, PA was one of the senior reenactors present to answer all questions. Beam said he served during the Korean War aboard the aircraft carrier USS Lake Champlain. Beam said he and the other members of the group brought their collections out to show people what it was like for the journalists and photographers who covered the war – often moving right along side of the men fighting in the field. A display of cameras and other equipment used by Signal Corps photographers. Joining Beam in the press tent was Chuck Berrier of Carlisle, PA. Berrier pointed out that General Eisenhower insisted the war be covered as closely and as accurately as possible. To that end, Ike had special passes made for the journalists and photographers which allowed the press almost unfettered access to the action. 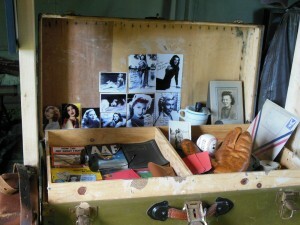 On display were portable typewriters, vintage stationary, dozens of cameras and even a darkroom in a box. Berrier said most of the photographers used 4×5 Speed Graphic cameras, though some on the front lines preferred the more manageable 35mm models. Ironically, many of the better made cameras used by American photojournalists were crafted before the war in Germany. 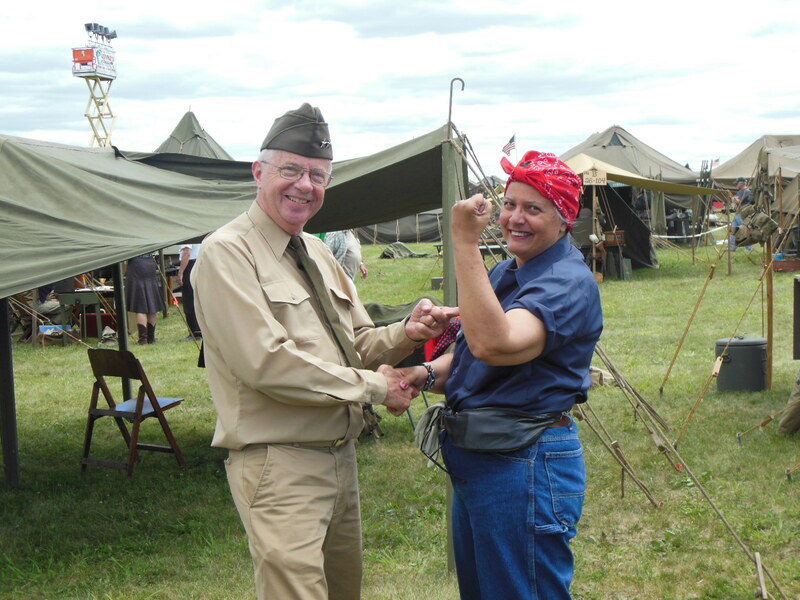 Conversation about cameras was interrupted by a photo-op with Rosie the Riveter (Linda Johnson of Long Island) who teamed for pictures with Stanton Pratt as Maj. Gen Lyman Lemintzer. Reenactors Stanton Pratt and Linda Johnson. Pratt, who grew up in Lemnitzer’s hometown of Honesdale, PA., is one of the lucky reenactors to portray a figure he personally knew. Though not necessarily a household name, Lemnitzer had a distinguished military career, serving as both the Chairman of the Joint Chiefs of Staff and the Supreme Allied Commander of NATO. During the war, Lemnitzer was assigned (respectively) to the staffs of both General Eisenhower and Lt. Gen. Mark Clark. In those posts, he helped form the plans for the North Africa and Sicily campaigns. But his notable career notwithstanding, it was while aiding Clark, Pratt recalls, that Lemnitzer entered the annals of Army legend. In an area just west of the press tent, reenactors representing the U.S. Army Air Corps recalled life for the men who brought the war to the Enemy’s own backyard. Phil Escobar, an Aberdeen, MD native who now lives in Frederick, MD, became interested in WWII reenacting after attending the now defunct Great Frederick Airshow. 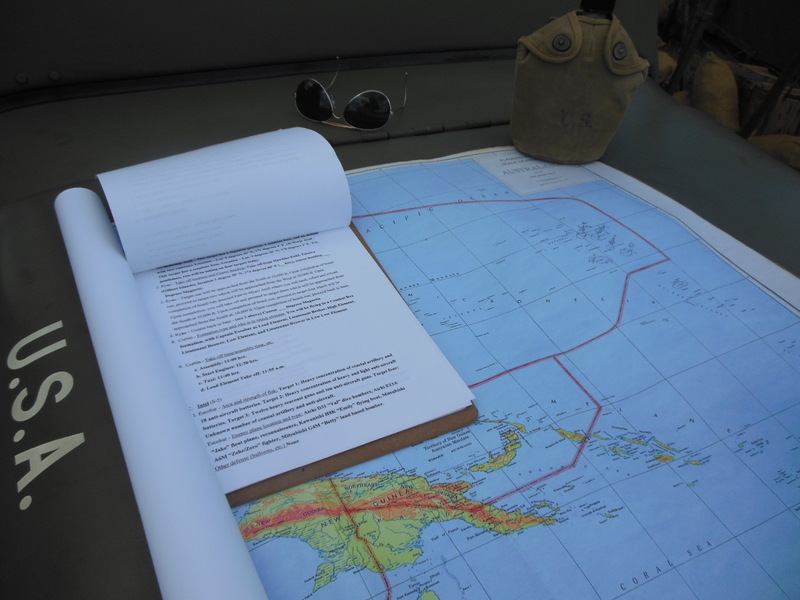 Now in his third year as a reenactor, Escobar discussed the war maps the group uses for their “mission” briefings. Authentic war maps were digitally re-created for use in “mission” briefings. Escobar said his group – the Allied Airmen’s Preservation Society – Mid Atlantic District – teams with the crew of the B-25 J Mitchell bomber “Panchito” to stage the rescue of wounded airmen returning from a mission, then being moved to an army field hospital. Joining Escobar for the morning briefing was Bruceton Mills, WV resident Patrick J. Ryan. A real-life pilot, Ryan has developed an affinity for the airmen of WWII and for some of the people who have made a lasting mark on the American landscape. Ryan’s experience with reaching out to luminaries from another era isn’t limited to those who served in the military. Ryan has also been in touch with several starlets from Hollywood’s halcyon days; women whose likenesses would have adorned innumerable footlockers and barracks walls. Patrick Ryan’s memory laden footlocker. 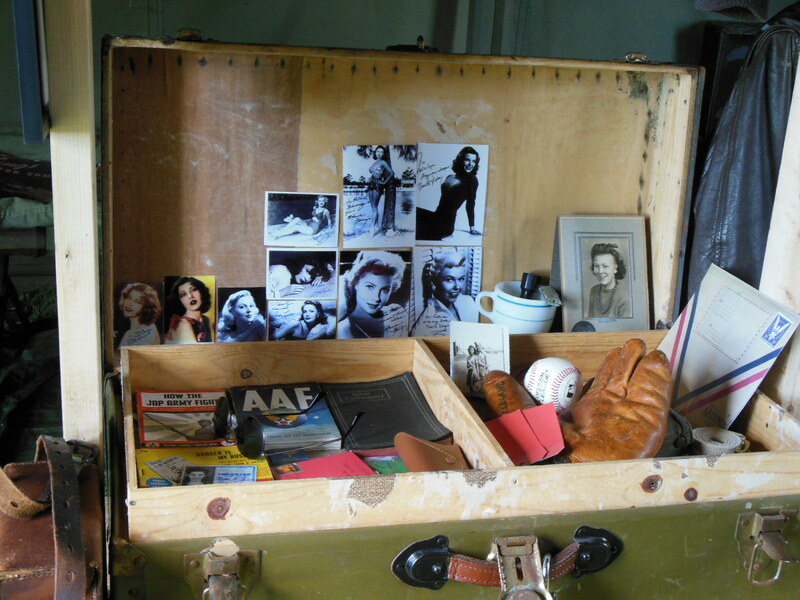 Amongst his prized collection is an autographed still and Christmas card from Warner Bros. actress Joan Leslie. Ryan paused for a moment to reflect on the ones who are no longer here; the people who didn’t survive the war. Then he shared a few thoughts about D-Day and the present state of affairs. The 24th Annual World War II Weekend runs from June 6-8 at the Mid-Atlantic Air Museum, 11 Museum Drive, Reading, Pa. 19605. More information about the museum may be found here or by calling the museum office at 610-372-7333. Information about reserving warbird plane rides may be found here. The 23rd Annual World War II Weekend runs from June 7-9 at the Mid-Atlantic Air Museum, 11 Museum Drive, Reading, Pa. 19605. More information about the museum may be found here or by calling the museum office at 610-372-7333. Information about reserving warbird plane rides may be found here. I’ve been a WWII reenactor for 14 years and I take my impression seriously. Looks like Linda Johnson doesn’t take her impression seriously or else she would not be wearing a fanny pack!! !